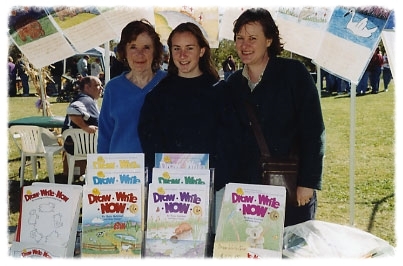 Marie Hablitzel started working on Draw-Write-Now, Book 1 in 1992. Barker Creek Publishing was a start-up business and Draw-Write-Now was to be it’s first product. Carolyn Hurst, the owner of Barker Creek and editor of the books, invited Marie to attend meetings with the designer and production people, and since I was Marie’s daughter and Carolyn’s friend, I got to go along. The cover was designed early in the process and four sketches were presented—the farm-scene design was selected. Marie already had a long list of drawings to complete, so Judy Richardson, the book designer, was given the assignment to draw the cover. Judy presented cover artwork, but Carolyn wasn’t happy with the results—Judy’s drawing style was not like Marie’s. Carolyn and Judy decided to scrap the design and to ask Marie to draw the second-choice design, when I meekly said, “I think I can draw it.” They looked at each other, then turned to me and said, “Okay, do it!” Well, I did it, and my art was used on the cover. I kept going to meetings and helping Marie in any way I could. At some point before Draw-Write-Now, Book 1 went to press, Carolyn asked Marie to make me her coauthor. Initially, I was hesitant—after all, the lessons came from Marie’s creativity, experience and hard work—but, Carolyn used good business sense. I was able to help with the promotion and production of the book series, plus I knew and understood Marie’s teaching and artistic style like no one else. Throughout the series, Marie created the lesson drawings, while I did the cover drawings, helped with illustrations and worked on text. Judy continued to oversee the designs elements. Carolyn edited the books and formatted the books, along with the help of several amazing production artists who embraced the 1990’s computer technology. In the end, I think we all realized that the collaboration was perfect! After 20 years of publishing the Draw-Write-Now series, Barker Creek sold the series to Rainbow Resource Center, Inc. We look forward to working with the Rainbow Resource team! ABOUT US - We are the authors of the Draw-Write-Now eight-book series. SEE THEIR ART - See children's drawings and writing.